As mentioned in the previous post, I was having some luck spotting some tattoos while riding my bike along the path that runs along the southern tip of Brooklyn. Last weekend, I was riding north and passed a woman sunbathing in a bikini in the grass along the bike path. I noticed she had some sort of intricate pattern inked on her foot. Yes, I am that committed to Tattoosday that when I see a woman in a bikini, I notice her foot! However, I chose not to stop and disturb her and kept riding. Yet, the image of her tattooed foot hounded me, and by the time I had reached the 69th Street Pier and grabbed some water at a local store, I had decided to head back a couple of miles and see if she was still there. Of course, she was gone. I stopped my bike and looked at the spot where she had been and thought of what might have been. I checked the time on my phone and was getting ready to head home when a guy named Danny walked by on the path. He has 12 tattoos. I approached him and we started talking about his ink. Danny is Brooklyn-born and raised, and a lot of his friends growing up were graffiti artists. 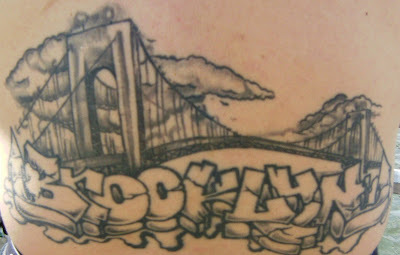 This street-style tattoo is true to his upbringing and a key element of his roots in South Brooklyn. The piece was inked by Mr. Kaves at Brooklyn Ink. Danny explained that Kaves ran Brooklyn Ink before the current owner Joe had the shop (he has work by Joe as well). There's a nice piece about Mr. Kaves in Prick Magazine here. Kaves is a founding member of The Lordz, a well-known rock-rap band. They were featured in five episodes of a show called "The Brooklyn Way" which aired on FUSE. The show website is here. Thanks to Danny for sharing his Brooklyn ink with us here on Tattoosday! Last weekend, while riding my bike along the Shore Promenade at the southern tip of Brooklyn, I spotted the back piece above. Although it is not completed, Chris, to whom the tattoo belongs, was more then happy to share it with us. The story of this tattoo goes back a bit. Chris explained to me that, when he was seventeen, his father took him to get a tattoo. He got a piece on the left side of his back. He recalls his mother being beside herself over this, upset that he had gotten a tattoo at such an early age. You can tell from the photo that, on the left side, one of the wings is covering the previous tattoo. Eventually, one won't be able to tell it was there. Chris' mother passed away several years ago and he began this back piece to honor her memory. The central figure is the religious icon from Mexico Our Lady of Guadalupe. Not only is it a spiritual tribute, but it is a practical one in that it is covering up the tattoo that Chris so vividly recalls upsetting his mother. This grand design has been a work in progress for three and a half years. Renee at Memphis Tattoo has been the artist working on the piece. Work from Renee at Memphis Tattoo (now called Top Shelf Tattoo) appeared previously on Tattoosday here. Thanks to Chris for sharing his tribute to the memory of his mother with us here at Tattoosday! No offense to people with tribal tattoos, but they (the tattoos, not the people) generally don't generate much interest from me. Unless they are incorporated into a bigger design concept (like this tiger lily piece), they don't seem particularly interesting. I know, I know, that's a sweeping generalization, and there will always be exceptions. But, I digress. The title of this post is "April's Tribal." On occasion, a tribal piece does call out to me, as April's did last Friday at the 86th Street subway platform in Bay Ridge. Again, there is no earth-shattering story behind it, and had it been smaller in scope on an ankle or lower back, I may have kept walking. She had initially envisioned having a short sleeve, but after the initial back piece was completed, she just never finished it off. April didn't seem too concerned, though: "It's on my back, so I never see it," she smiled. John had much ink and, as often happens when I ask, a previously unseen tattoo is revealed which is just as impressive as all the other visible work. 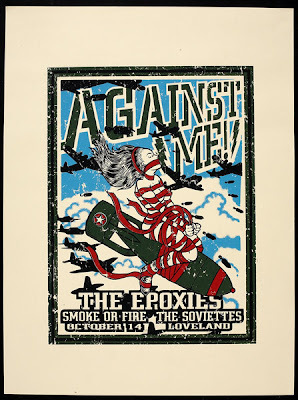 The poster is from a October 14, 2005 gig in Portland, Oregon at Loveland, with the bands The Epoxies, Smoke or Fire and The Soviettes. The designer is Mark McCormick Lee Zeman* who is associated with the company Mad Pakyderms. John said that the art, and hence the tattoo, represents to him the sentiment that "untouchable is something to be". He had this done when he moved away from home, went out on his own, and started taking care of himself. This was inked by Chance Kenyon out of Jack Brown's Tattoo Revival in Fredericksburg, Virginia. John was on his way back home from New York where he was spending his honeymoon with his new wife Liz. See the post below to see the tattoos John and Liz got to commemorate their union. Thanks to John for sharing his awesome tattoo here on Tattoosday! That is AWESOME!!! Thanks so much for sharing it with us. I am Mark McCormick, but Mad Pakyderms is myself and Lee Zeman. That particular poster was created by Lee. If you could credit him accordingly that would be amazing! I'll be sure to let him know about it and direct him to your site to see it for himself. I'm actually moving to NYC myself next month. Perhaps you'll see me on the street someday and ask me about my own tattoos. HA! Awesome site, man! Thanks again! Battle on! I have amended the post to give proper credit to Lee Zeman. You can see more or Lee's work at www.gigposters.com here. If you've never checked out the gigposters site, do yourself a favor and go exploring. It's fun! At the tail end of my discussion with John about his tattoo (see the post above), he revealed that he was here in New York with his new wife Liz. Ah, a honeymoon in the Big Apple! Liz and John posed the above tattoos for the occasion. I generally don't go on and on about the photos I take, but I just love how this photo came out: John's wrist nesting lightly in Liz's hand. The matter-of-fact delicacy and naturalness of their two arms connecting just makes the photo that much more compelling. Anyway, Liz explained that this was the logo for the Young Pioneers, and that their slogan "Build your own nation," or "Make your own country," seemed an appropriate visual metaphor for a new life together. But, as a disclaimer, I had difficulty locating this exact emblem and connecting it to the youth organization in the former Soviet Union. But, my being able to do so is moot. The logo is striking and it's symbolism is brilliant. Thanks to Liz and John for sharing their nuptial ink on Tattoosday. Here's wishing them a long, happy life together! Earlier this month, I posted this tattoo which was a tribute to Olivia Rose, a new daughter born to Vicki. I mentioned in the post that it was Vicki's tattoo below her neck which first grabbed my attention, but that Vicki offered up her newer piece for us here at Tattoosday. Vicki has recently sent me a photo of the original tattoo I saw on her. It's a nice, simple shamrock and hearts. This, like the other piece, was inked at True Blue Tattoo in Queens. Alex McWatt is the artist. Vicki writes: "I got the design for a few reasons. First of all, I am Irish and I wanted to get something to celebrate my heritage without getting a flag tattoo. Second, my boyfriend, the love of my life, is 100% Irish, and I wanted to get a tattoo to symbolism me and him - that is what the two hearts are for. I chose to get it on the back of my neck so it would be out there for the world to see." Thanks again to Vicki for sharing her ink here with us on Tattoosday! I met Vincent Corrigan on the way to the subway on 33rd Street between 7th and 6th Avenues. It was a giant arm piece that crawled up under his shirt and onto his shoulder that first caught my eye. However, he offered up the piece above and, in the course of speaking with him, I took pictures of three other tattoos that were notable. I am going to discuss them in reverse order. 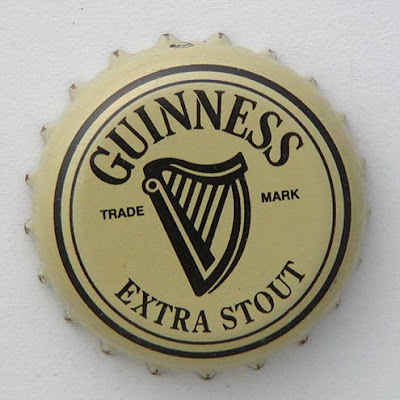 Not to overstate the obvious, but Guinness is a dry stout beer that originated in Dublin, and is thus a matter of pride for the Irish. Mr. Corrigan, as one might venture from his surname, is of Irish ancestry. The harp is on the top of his left bicep and is one of his older pieces. In fact, he credits Ryoko at Brooklyn Tattoo for taking what was previously a bit of shoddy inkwork, revitalizing it with some excellent restoration and making a respectable tattoo out of it. The top one is the logo familiar to fans of the band Audioslave. 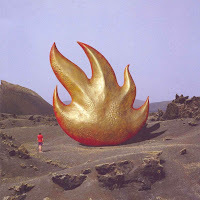 The fiery emblem appeared on the band's debut album cover. Vince is a singer and a huge fan of the singer Chris Cornell (lead singer of Audioslave, and more famously, Soundgarden). unlike Vince who guesses he's seen him twenty times). Robert Plant's symbol is the feather of the Egyptian goddess Ma'at, representing truth, justice, fairness and writing, encapsulated by an unbroken circle representing life. According to Egyptian mythology, Osiris, the god of judgment and death, would take the heart of those who died and put it on a balance with the feather of Ma'at. If the heart outweighed the feather, the person's soul would go to hell, but on the other hand, if the heart was lighter than the feather, the soul would go to heaven. However, Plant's rune is significant to Vincent because he is the lead singer. Vincent indicates that this is the "Spear of Longinus," one of the many names given to The Holy Lance, which was the weapon used to pierce the side of Jesus Christ during the Crucifixion. derives from a root word which means "spear" or "lance". It is this primary parallel that gave Vincent the urge to ink this relic of Christianity onto his arm. It appears that the tattoo is modeled after the Hofburg Spear which is kept in Vienna. This spear is an object of fascination in literature and the arts, often as the subject matter for narratives pertaining to the Crusades, with a link in some cases to Ireland. This brings the spear of Longinus an additional link to Vincent's pride in his Irish ancestry. 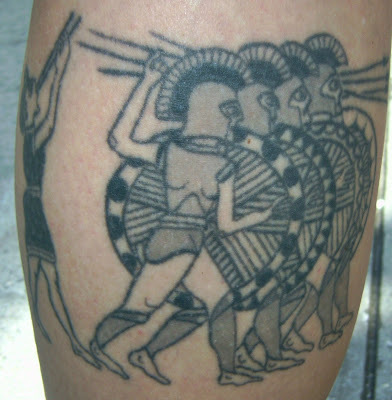 The spear tattoo, along with the Audioslave and Robert Plant tattoos, was inked by artist Eric Wigger at The Devil's Rose Tattoo in Blue Point, New York, on Long Island. Thanks to Vincent for sharing all his ink with us here at Tattoosday! As they say, imitation is the sincerest form of flattery, and earlier this month a young lass named Mel over in Newcastle contacted me to ask my blessing to spin off the blog over in England. I blessed and she's off with it. Check it out here. I spotted this beautiful cross of flowers on the back of Kelly's neck in front of the entrance to Penn Station on Seventh Avenue. Kelly's floral cross is a memorial for her best friend who died in the last few months. The tattoo was inked just a month ago. She didn't offer many details about her friend's death, nor did I press her for them, as she seemed to me that she was still deeply saddened by his passing. The phrase "carpe diem," Latin for "seize the day," is among the most popular "word tattoos," and for good reason. The concept of carpe diem has helped people live their lives proactively, rather than passively. Juxtaposed with a memorial for a young person who was taken from life early, it seems especially poignant. Thanks to Kelly for sharing her two tattoos with us here. The loss of a close friend is not easy. Here's hoping both pieces give her the strength she needs to move forward and past this difficult time. This awesome portrait was jumping off of Kelly's right shoulder in Penn Plaza last Wednesday. Kelly has ten tattoos in all, but she chose this portrait for Tattoosday, inked six years ago by Joey Ortega at Kingpin Tattoos in Harker Heights, Texas. This was, according to Kelly, Ortega's first portrait, and he created for her a lasting memorial to her grandmother, who had meant the world to her. Kelly was in town visiting with her friend Amber. They have matching tattoos. See them below here. Thanks to Kelly for sharing such a meaningful tattoo here with us on Tattoosday! This is a continuation of sorts, from the post above. When I met Kelly, she was hanging out with her friend Amber. And although Kelly appeared to be the more inked of the two, Amber was very positive and enthusiastic about the concept behind Tattoosday. So after taking a picture of Kelly's tattoo, I turned to Amber and asked if she wanted to share as well. The two decided to show off their "Punx" tattoos, both inked on their wrists on the occasion of their 21st birthdays. According to Amber and Kelly, the "Punx" label is affiliated with the band The Transplants, headed by Lars Fredrickson, formerly of the band Rancid. According to Kelly and Amber, it is common for fans of the band to get this tattoo as a mark of solidarity. They don't remember the name of the shop where they had these spur of the moment tattoos done, but they do recall that it was a place near the River Walk in San Antonio, Texas. Thanks to Amber and Kelly for being so cool and sharing their ink with us here at Tattoosday! In probably one of my shortest posts, I present you with the frog above, inked on the left leg of Kelly. I spotted this beautiful tattoo as Kelly and a friend were waiting for some food at a cart on the corner of 33rd and 7th Avenue. Her hands were full and she seemed a bit in a hurry, so I don't have a lot of details (as well as not a perfect picture), but Kelly was in New York, visiting from Florida, and she has loved frogs since she was a kid. Even though the picture is a bit washed out and the back part of the tattoo is partially obscured, one can still see the vivid color and phenomenal detail that makes this piece just pop off of the skin. 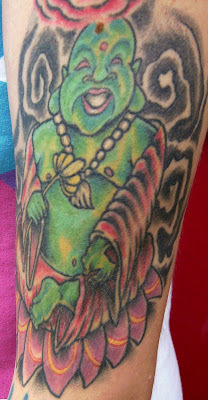 Kelly has 7 tattoos in all (one of which is a cool, but not as cool as this one, frog on the back of her right leg. This frog was inked about two and a half years ago at Livewire Tattoo Studio in Jacksonville Beach, Florida. The artist was Angelo, who is no longer listed on their website. Thanks to Kelly for sharing her awesome amphibian tattoo here with us at Tattoosday! Frankie designed this cartoon portrait of herself with her brother holding hands. The tattoo is on her left bicep. That's her on the right, with the red hair. She had this inked at Village Pop Inc. on West 4th Street in Manhattan. I caught Frankie on the R train and took the photo on the 95th Street platform in Bay Ridge. Thanks to Frankie for sharing this poignant tattoo here with us at Tattoosday! When I passed Crys on Seventh Avenue last Friday, I knew I had to stop and ask about his arm. Aside from the matching ohms-within-nautical stars on both elbows, Crys has two main pieces on his left arm. He got it basically because he liked the design. It was inked by Nick at True Blue Tattoo in Austin, Texas. 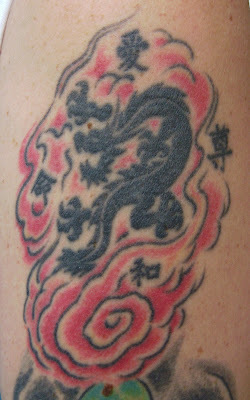 The kanji surrounding the dragon were added later at Atomic Tattoo & Body Piercing, also in Austin. These were gifts from Crys' girlfriend. According to Chrys, going clockwise from the top, the kanji represnt love, honor, peace and life. 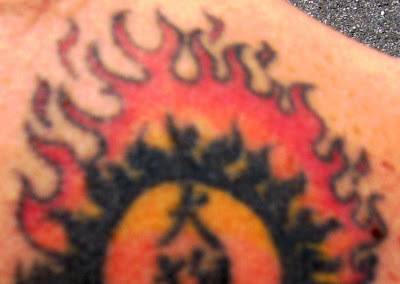 After that, he went back later to Atomic Tattoo and added the fire around the dragon to give his arm more color. Actually, a friend of his, Corey, from Austin, designed and drew up the initial sketch. Crys doesn't remember where it was inked. Thanks to Crys for sharing his arm with us here on Tattoosday! As you may have guessed from the title above, this is an educational post. Anna has four tattoos, but it was this one, on the back of her left calf, that caught my eye as she passed me on Seventh Avenue last week. I stopped to ask what this was all about. And I felt like I was back in the classroom. Absolutely fascinating! So why is the Chigi vase, a piece of Corinthian pottery dating back to around the 7th century, B.C., important? 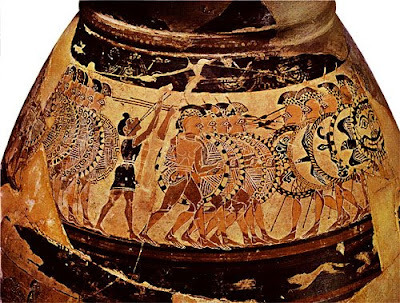 Anna explained that it is on the vase that the first artistic representation of the Hoplite Phalanx formation appeared. Or, the earliest surviving representation. It is in this battle formation that soldiers are lined up in such a way that the soldier next to them uses their shield to protect their neighbor. The economic formation proved very effective and it was an important step in democracy, as a group of soldiers banded together to form one cohesive unit. Anna is an alumna of Reed College in Portland,Oregon, where she studied the Classics. I didn't mention to her at the time that I was a graduate of Occidental College in Los Angeles, a similarly small liberal arts college where there is a deep tradition of teaching the Classics. So, I got why she had this tattooed on her, not to mention how nicely done it was in the first place. Aside from the liberal arts background, I also related to Anna on the level that she is originally from the Central Coast of California, near San Luis Obispo. Although my connection to California is in L.A., to the south, I still have 12 years of life in the Golden State ingrained in my identity. This is in fact, a strawberry plant, which is an integral part of the agricultural identity of the central section of California. The tattoo is based on the watercolors first recorded in what is known as the Clutius Manuscript, a 16th Century work of early botanical paintings. You can check out the link below for more information on this collection. Anna, who also blogs here about her adventures with fresh vegetables and fruits in New York City green markets, had these tattoos inked in Portland by the artist Amy Cole. Ms. Cole works out of Tiger Lily Tattoo and Design. Thanks to Anna for sharing her cool (and thought-provoking) body art here with us at Tattoosday! Meet Priscilla. That's her above on Maeve's arm, as seen last week on 6th Avenue. Maeve offered her to Tattoosday from among the thirteen tattoos she has. Priscilla, as Maeve calls her, is based on the pin-up art of Alberto Vargas. Check out more of his work here. The work on which she is based initially had her as a blonde, but Maeve, made her a brunette. She also chose to have her smoking because, although she acknowledges that it's bad for you, it's still pretty cool-looking. 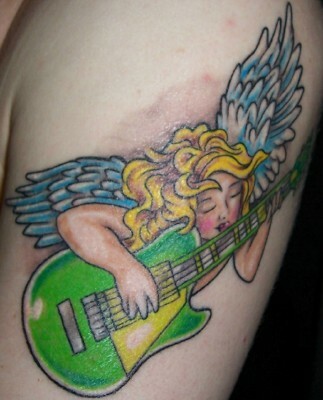 This beautiful tattoo was inked in November 2007 by Aryn at Twysted Imagez Tattoo Studio in Alexandria, Virginia. Thanks to Maeve for sharing Priscilla here with us at Tattoosday! I met Massimo on the plaza in front of Penn Station last Friday and talked to him about this cool piece he has on his right foot. 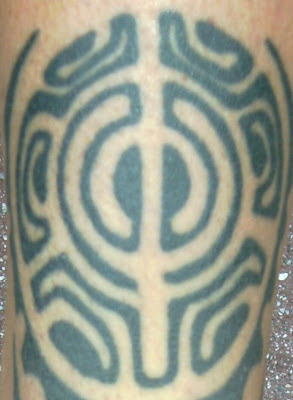 He was visiting from Milan and, according to him, designed and tattooed this himself about seven years ago. He had a friend who was a tattoo apprentice around that time, who taught him the basics of tattooing. He began by saying this was Hawaii-inspired, which is understandable, as it has the "look" of a Hawaiian tiki in its design. He was also very candid with me and said that he was smoking a lot at that time and he would wake up the next day and find incredible designs lying around. This was one of them. After I took the picture, Massimo had second thoughts, hesitating about letting me post this on Tattoosday. He was worried that his design would be copied. I appealed to him and I must have been convincing, as he changed his mind and assented. Thank you, Massimo, for sharing this design with us here at Tattoosday! On Wednesday I met Chris, outside of the hotel across the street from my office. He sported four tattoos in all, but this one was the most fascinating. Chris was in town (he resides in Ripon, California) on business as the tour caterer for Neil Diamond (he has also worked for Tim McGraw, Faith Hill, and others). 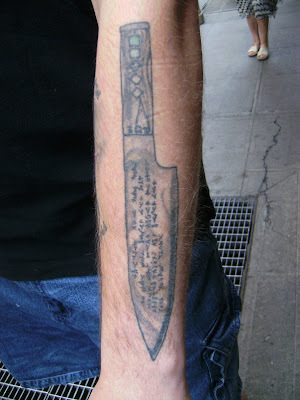 The knife, on his left forearm, is a portrait, one could say, of his own chef's knife. Clearly, most chefs have a connection to the tools of their trade. I would imagine that a favorite knife would be near and dear to one's heart. Chris' tattoo is testament to that fact. Chris actually takes this portrait a step further and incorporates other elements into the knife tattoo. Their are markings on the knife that appear almost like runes. This is actually written in the Cherokee tongue, a tribute to his heritage (his father is Cherokee). When I asked if he could tell me what was inscribed in the blade, he smiled and shook his head. He doesn't disclose the deeply personal nature of the message to anyone. One additional element that I would have not noticed had he not mentioned it are the geometrical shapes on the hilt of the knife. Chris explained to me that he is a snowboarder as well, and each shape represents the trail marking symbol for a slope that he has conquered while boarding. Chris told me that this unique piece was inked by Craig Foster at Skinwerks Tattoo and Design in Carrollton, Georgia (about 50 miles from Atlanta). I was excited to hear this as Craig's work has appeared on Tattoosday previously here. His work is phenomenal and I am fortunate enough to have come across his ink up in New York. Check out their shop site here and see what other amazing work they do there. Thanks to Chris for sharing his "tat-tool" of the trade with us here at Tattoosday! Kate had this tattoo inked about 8 years ago somewhere in New Jersey. She doesn't recall the artist or the shop, but that is often quite common. The piece, which is on her right bicep, was designed by a friend of hers who was a tattoo apprentice. She likes this simple floral design because it reflects her philosophy. To Kate, flowers represent life. Even though they die, she notes, they come back to life when they blossom again. Such is a very affirming and positive outlook on the world. Thanks to Kate for sharing her tattoo here on Tattoosday! I met Michele in the middle of the day last Wednesday. I was riding my bike on a vacation day and she was sitting on the Shore Promenade while on a lunch break. The tattoo above is small, but I liked how Michele described it. The piece is about sixteen years old and was done by an artist named Vinnie. This was the first of her three tattoos and she picked it off of the flash art on the walls in his shop. Michele liked the size of the piece, thought the rose was beautiful, and dagger through the heart next to the rose sends a message. In her words, "if you get too close to something beautiful, you might get hurt." Thanks to Michele for sharing her first tattoo here with us on Tattoosday! Last Saturday I was riding my bike on a gorgeous day (see this post here) when I passed Erica who was sitting on a bench along the Shore Promenade. It seemed interesting so I asked her about it. She said there really wasn't anything interesting about it but I told her to try me. Sometimes when you've lived with a tattoo for a while, the circumstances surrounding the piece seem ordinary. But to a fresh set of ears (and a blogosphere full of eyes), the story can be fascinating. About 12 years ago, and a year or two out of high school, Erica was dating a gang member. (See? Interesting already!) She was born in 1976, the Year of the Dragon in the Chinese Zodiac. Her boyfriend's gang nickname was "Big Dog," and not wanting to have that written in English in the tattoo, she had the Chinese translation inked in the piece. When people asked, she would just tell them in stood for "Year of the Dragon". She notes, however, that she has received a negative reaction from the Chinese women who work at the nail salon. So, she acknowledges, the inscription probably isn't very nice. “Big Dog”. He acknowledged that the reaction that Erica has experienced is probably due to the elementary nature of the words. As written, it is a literal interpretation of the meanings, and not necessarily in a flattering way. To make this piece even more interesting, the tattoo was done at a defunct Bay Ridge shop called Ink Masters (their work has appeared previously here). She noted that the guy that tattooed her was named Eric and that she knew he had been "featured" in a film called "Erica" (same spelling as her name, incidentally), which was, in fact, an adult film. Erica wanted me to reiterate, the tattoo artist had been the adult film star, not her. Finally, to make this tattoo's tale complete, two years after she had broken up with "Big Dog," she regretted the youthful folly that had caused her to get the tattoo. Rather than laser it off, or cover it up, she chose instead to improve it by adding flames to it to represent her anger over getting it in the first place. Often, asking someone about a visible tattoo is rewarded by the unveiling of a much more significant piece (see here and here for two of the best examples on Tattoosday). The new piece above, a pattern of fifteen dots, was inked by Erick Diaz at Asylum Studios in the Williamsburg section of Brooklyn. Erica entered the shop not with the intention to get tattooed, but to accompany her cousin Samantha when she went in for a tattoo. Samantha has an interesting story. Many years ago, she had been a passenger in a vehicle that was involved in a drunk driving accident. She was ejected from the vehicle and hospitalized in critical condition. In a coma, Samantha faced life-threatening circumstances when her brain underwent significant swelling, so much that part of her skull needed to be removed to accommodate the condition. Ultimately though, Samantha recovered and was none the worse for wear. She currently is residing in South Africa and working as a photographer. So Samantha was visiting her cousin Erica who took her to get a tattoo. When Samantha was getting the phrase “the sky is my only witness” inked, Erica was watching, knowing that she needed to get a new tattoo that honored her cousin’s miraculous recovery. the number 26. Erica wanted a representation of a magical date, July 26, the day when Samantha opened her eyes and emerged from her coma. The piece is inked on the lower right side of Erica’s stomach, along the waistline. It serves to remind her about the value of life and mark the date that is so important in the lives of her family. I want to thank Erica for her taking the time to talk with me, and for sharing her interesting stories about her ink here on Tattoosday. I introduced myself to Thea on the 86th Street train platform after spotting her awesome neck tattoo. There's something about the train platforms and subways of New York that is a challenge to Tattoosday. Generally, when New Yorkers descend to the subway system, an additional layer of protective on-guardness (I know it's not a word, but it nails the sentiment) is added. For this reason, I generally leave the inked alone. But like every "general rule," an awesome tattoo trumps everything. So I snapped the photo of Thea's neck on the platform, and we chatted briefly there and on the R train after it rolled in. 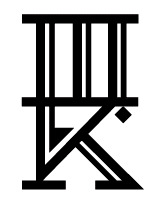 The piece is in Arabic, featuring the two words for "life" and "music". Although not an exact translation, Thea interprets the juxtaposition of both words as "life is music". She acknowledges it is not a precise translation, but that it is the meaning she derives from the piece. Thea is a singer, and music is an essential part of her identity. I must agree, it is an apt choice for ink, and I personally believe that Arabic is one of the most beautiful languages, as written. The way that Arabic is incorporated into Eastern art is unparallelled. 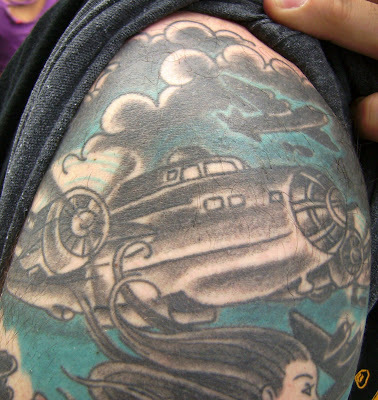 The tattoo was inked at Porcupine Tattoo in Brooklyn. Thanks much to Thea for sharing this awesome neck tattoo with us here on Tattoosday! Although it was the shamrocked neck piece that first grabbed my attention, Vicki offered up the above piece on her right shoulder instead. Vicki explained that this rose tattoo is in honor of her daughter, born just two months ago. The piece was inked only last month by Michelle at True Blue Tattoo in Queens. As a fellow inked person with two tattoos honoring my two girls, I certainly can appreciate the piece that honors one's kids. Thanks to Vicki for sharing her fresh tattoo with us here on Tattoosday. Welcome to the world, Olivia Rose!